Radiation therapy dose escalation, pelvic lymph node irradiation, and hormone therapy duration are prescribed based on patient and tumor characteristics. Selected patients at elevated risk for biochemical recurrence of prostate cancer (PCa) following radical prostatectomy (RP) may benefit from tailored postoperative management involving radiation and hormone therapy, according to new study findings published in Prostate Cancer and Prostate Diseases. 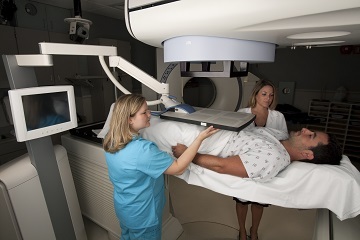 Investigators termed this approach combined-intensified-modulated-adjuvant (CIMA) treatment, which involves radiation therapy (RT) dose escalation to the prostate bed, pelvic lymph node irradiation (PNI) for patients at higher risk of regional failure, and adjuvant hormone therapy (HT) for patients with a higher risk of distant metastases. The phase I/II trial, by Giovanna Mantini, MD, of Università Cattolica del Sacro Cuore in Rome, and colleagues, enrolled 123 men younger than 80 years who underwent RP for non-metastatic PCa and who were not previously treated with RT, HT, or chemotherapy. Patients needed to have at least 1 of the following risk factors: extracapsular extension and/or positive surgical margins, and/or seminal vesicle invasion, and/or regional lymph node invasion. Physicians prescribed radiation doses, PNI, and HT duration according to patient and tumor characteristics. Patients had a median follow-up of 67 months (range 37 to 120 months). The actuarial 5-year biochemical disease-free survival (bDFS) rate was 92.9%, which was an improvement on the 5-year bDFS rate of 74% achieved with RP followed by postoperative RT in the European Organization for Research and Treatment of Cancer (EORTC) trial 22,911, the authors noted. The study by Dr Mantini and colleagues found that the 5-year bDFS rate was significantly higher among patients with Gleason score 7 or less cancer than those with Gleason score 8 or higher cancer (95.5% vs 85.5%). Mantini G, Siepe G, Alitto AR, et al. Tailored postoperative treatment of prostate cancer: final results of a phase I/II trial. Prostate Cancer Prostatic Dis. 2018; published online ahead of print.